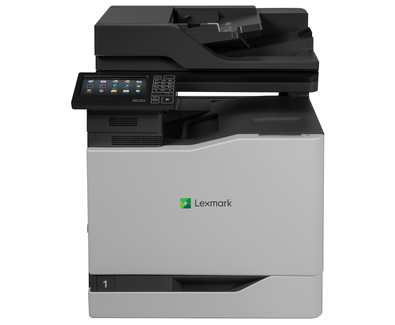 The Lexmark CX820 workgroup colour A4 MFP prints up to 50 pages per minute and has business-class features like preinstalled software solutions and optional staple finisher. A 1.33 GHz quad core processor with 2 GB of standard memory helps the CX820 Series handle complex jobs, while print speed of up to 50 ppm allows users in high-volume print environments to get fast colour output. Even large colour print jobs complete quickly so users are more productive. The CX820 Series’ 17.8-cm (7-inch) eTask colour touchscreen features an ultra-smooth surface that can be activated by almost anything, including pens, fingertips or nails – without pressure or direct skin contact.